With the chilly weather expected to bring freezing temperatures this week, we all need to take care of our pets to keep them safe and warm. Does your dog prefer to cuddle up with a blanket on the sofa, rather than go for a walk outside? Just because your dog has a heavy, thick coat, he will still feel the temperatures drop. It’s just as likely that your dog will suffer from low body temperature and even hypothermia, and frostbite symptoms of frozen skin, as humans do. A dog’s fur coat will provide some protection against the terrible, cold weather, but the majority of domestic dogs are not adapted to cope with freezing temperatures. With some common sense and simple steps, you can safeguard your dog from the freezing cold. 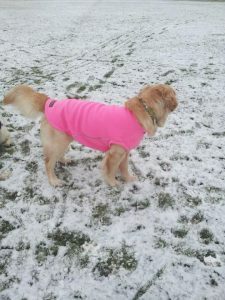 Many of the precautions and measures you take yourself to keep warm, will also keep your pooch warm and safe. A dog’s ears and nose are very exposed in freezing cold weather, and their paws in contact with cold pavements, so it’s best to only take them outside for periods of exercise and activity, with shorter, brisk walks. Never place your dogs outside for long periods of time and leave them unattended. If your dog really doesn’t like the cold weather, its best to avoid late evening walks and instead change your walking routine and go to the park late morning or early afternoon, when you may at least see some sunshine. Play games of fetch and chase a ball together, keeping you both warm while you run around. Small dogs, and especially those without much hair, will benefit from a dog coat or jumper, especially when there is a chill in the air. Older dogs, and young puppies can also find it difficult to control their body temperatures and maintain body heat. When you’ve been out for a walk on frosty, icy pavements, get into the habit of always wiping your dog’s paws with a towel when he returns home. Snow, ice and salt can build up on his paws, causing painful, cracked areas on his pads. Keep the hair short and trimmed between his toes to prevent build-up of ice. Motorists use de-icers and antifreeze on their cars at this time of the year, but these chemicals can be deadly to your dog if swallowed. If your dog licks his paws, when he returns home after a walk, he can swallow these toxins. As we try to keep our homes warm, be aware of the dangers to your pet from open fires, wood burning stoves and gas fires. Your dog will edge towards the heat without realising that he could be easily burnt. A blanket or dog bed should be sufficient to keep him warm while he sleeps. Cold, dry weather can harm your dog’s skin. Add a coat and skin supplement to his food, to help to prevent flaky, dry skin. Fish and coconut oils are easy food additives that will help to keep his coat healthy and his skin moisturised. A small amount of coconut oil can be rubbed onto your dog’s paws if they appear to be cracking. The harsh winter season brings many worries for responsible dog owners. Biting winds and cold, numbing damp days can bring lots of discomfort for your much-loved pets. By paying special attention to your dog’s needs, and giving lots of snuggled cuddles with your pooch are a brilliant way for everyone to keep warm! Next Article Next Article: Can using essential oils help your dog to cope with anxieties and stress?